When you ask most businesses what insurance cover they have in place, public liability insurance is generally at the top of the list. This cover protects you financially against third party claims if you cause damage or injury as a result of your actions at work. Of course, your liability insurance can’t cover everything and there are certain exclusions you need to consider. Today, we’ll be looking at some of the common situations which won’t be covered through your public liability insurance. While public liability insurance is designed to cover you and your employees if a third party suffers damage to their property or injury, it won’t cover injuries to your employees. To make sure your employees are covered in the event of an injury, you need to make sure you have workers compensation insurance in place – remember, workers compensation insurance is compulsory in Australia! Although damage to a third party is covered with your liability, this doesn’t include any property which is under your physical or legal control – this includes any employee property. For example, if an employee’s vehicle is damaged, this won’t be covered under your liability insurance. Your public liability insurance will cover a range of circumstances but illegal behaviour isn’t one of them! If damage to property or injury to a third part occurs as a result of illegal activity, your insurer is unlikely to come to the party if you make a claim. This same goes for deliberate actions – if damage is caused on purpose, your policy generally won’t cover you. If you receive taxes, fines or additional penalties associated with your business, these generally won’t be covered with your liability insurance. Although you’ll be covered for the cost of compensation following a successful claim, this doesn’t include any additional punitive damages that the court awards a third party. 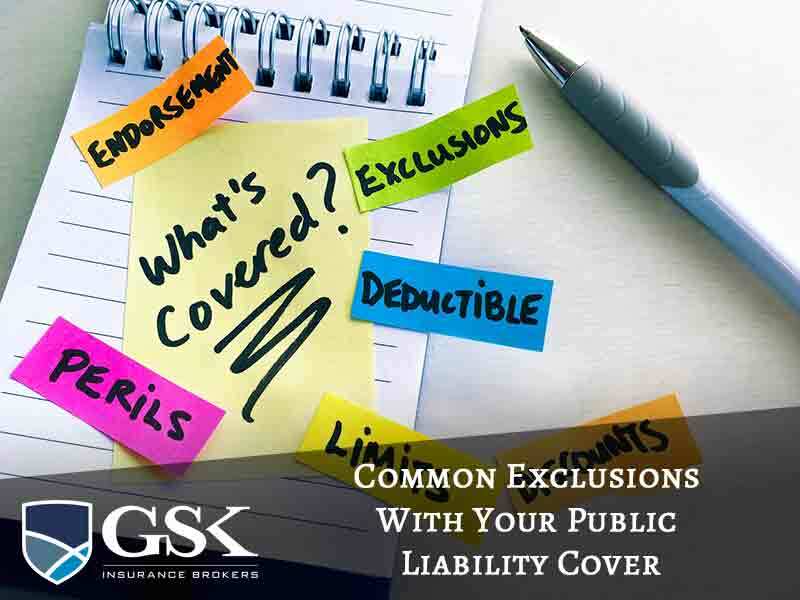 The exclusions attached to your liability insurance will vary according to the individual policy. To avoid any surprises at claim time, it’s a good idea to speak with your insurance broker. They’ll be able to advise you of any exclusions and will also ensure that they find you a policy which covers your specific set of risks. Here at GSK Insurance Brokers, we pride ourselves on our focus on customer service and personalised approach. We offer public liability insurance to businesses across Australia and will take a look at your unique situation to ensure that you’re getting the best cover possible for your specific risks. With us, you’ll have peace of mind that you’re protected financially when things go wrong. For quality public liability insurance in Perth or Melbourne, contact GSK Insurance Brokers today on (08) 9478 1933.